Pimsleur® equals success. Just one 30-minute lesson a day gets you speaking and understanding like no other program. This course includes lessons 11-15 from the Danish level 1 program featuring 2.5 hours of language instruction. Each lesson provides 30 minutes of spoken language practice, with an introductory conversation and new vocabulary and structures. Detailed instructions enable you to understand and participate in the conversation. Practice for vocabulary introduced in previous lessons is included in each lesson. The emphasis is on pronunciation and comprehension and on learning to speak Danish. 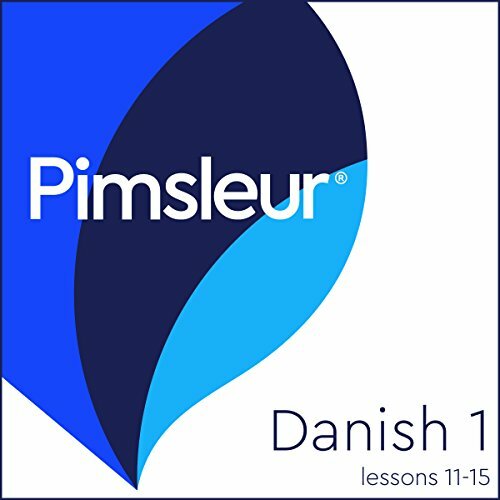 Reading lessons begin at the end of lesson 11 to provide you with an introduction to reading Danish. The reading booklet to be used with the audio reading lessons is included. Danish, a North Germanic language based on Old Norse, is spoken by some six million people, primarily in Denmark, although there are some speakers in Norway, Sweden, the Faroese Islands, and Greenland. Within the country of Denmark, there are many different dialects spoken. Generally the newscast or standard Danish (also referred to as rigsdansk), which is based on the dialects spoken in and around Copenhagen, is considered the most desirable dialect. This course adheres as closely as possible to standard Danish. Because of the large number of similarities between Danish, Norwegian, and Swedish, knowledge of any one of these languages makes it possible to understand the others. This is true for both spoken and written forms.